THE MOST EAGERLY AWAITED INVESTMENT BOOK OF THE YEAR • • • MORE THAN 80 CHART EXAMPLES • • • INCLUDES BONUS PSYCHOLOGY CHAPTER - MARK MINERVINI WITH PERFORMANCE COACH JAIREK ROBBINS • • • "Most traders and money managers would be delighted to have Minervini's worst year as their best... he has run circles around most PhDs trying to design systems to beat the market." -- JACK SCHWAGER, bestselling author of Stock Market Wizards • • • In Think & Trade Like a Champion, Mark will show you, step-by-step, how to use his time-tested principles to dramatically improve your performance and develop the confidence needed to achieve Superperformance. Mark reveals his personal trading rules and the secret techniques that made him one of America's most successful stock traders. You will learn how to use Mark's methods in your own trading and literally TRADE LIKE A CHAMPION! * * Mark is featured in Momentum Masters - A Roundtable Interview with Super Traders and in Jack Schwager's Stock Market Wizards: Interviews with America's Top Stock Traders. Schwager wrote: "Minervini's performance has been nothing short of astounding." . . . 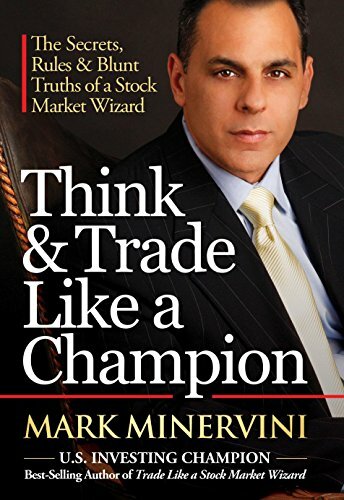 If you're ready to master the art and science of stock investing, champion trader Mark Minervini will show you how to dramatically increase your returns while keeping your risk to an absolute minimum . . . KNOWLEDGE THAT WILL EMPOWER YOUR TRADING FOR LIFE!